Mattress shopping is confusing. 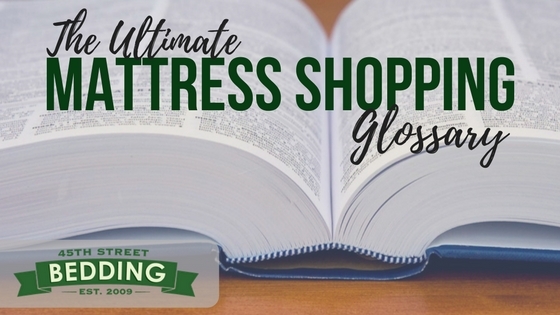 To lessen the confusion, we’re providing you with a glossary of terms thrown around the mattress industry. This is a live document, so if we’ve left any terms out you would like defined, please let us know in the comments and we will add them! Antimicrobial: Destroying or inhibiting the growth of microorganisms and especially pathogenic microorganisms. Base: (Also known as Box)This is a new age term for what is commonly referred to as a “boxspring.” In recent years manufacturers have moved away from the use of spring and coil systems in their bed bases, but the term boxspring has stuck around! Split Boxes: Not all boxspring can fit into every room in your house! A split box set comes in two narrower boxes, placed next to each other to support the mattress. (For example, a king sized box will always come in two pieces because there is no way a rigid box measuring 76″x80″ is going to move easily through hallways and doorways). Batting: Cotton, wool, or synthetic fibers in batts or sheets, used as filling for quilts or bedcovers. Blended Latex [see also Natural Latex or Synthetic Latex]: This is any foam created from a mix of synthetic and natural latex. They often tote a “best of both worlds” sales pitch with these types of latexes, but be wary, the use of synthetic latex is almost always related to its significantly lower cost. Body Impression: The indentations seen in the top of mattresses after consistent, repeated use, due to the compression of the materials used in the mattress over time. Bonnell System: This coil system is one of the most commonly used coil configurations in the mattress market. These mattresses use hourglass-shaped springs that are connected with cross wire to create one solid support system for mattresses. Border Wire: The wire surrounding the perimeter of the coil system within a mattress. There is typically one on the top and bottom sides of mattresses, and there purpose is to provide stability to edges of the mattress and hold all the coils in place. Botanical Latex, Botanicore™: Our patented latex! We use process similar to the dunlop process, but with imperative changes to ensure consistency and comfort throughout the entire piece of latex. Cabinet Bed: These are cabinet units designed to store a tri-fold mattress. When the mattress is not in use, it is folded and stored inside the cabinet. When in use the cabinet components fold out to create a support system for the mattress. Captain’s Bed [See also Storage Bed]: A platform bed with drawers and storage compartments built in underneath. Coils [see also Springs]: The steel springs used in mattresses. Comfort Life: The amount of time the mattress will remain comfortable with regular use and wear and tear. This is imperative when determining the value of a mattress. Mattresses with longer comfort lives tend to be more expensive, but are a better value because of their extended life. Continuous Coils: This is a coil system used in mattresses that is formed from one continuous piece of wire. Core: The heart of your mattress! The core refers to the main support system within the mattress. Some support systems rely on foams, while other rely on coil systems. Either way, you want a mattress with a durable core the reduce the risk of body impressions or sagging. Core Densities: The density of latex cores is measured in kilograms of latex per meter cubed (kg/m3). The higher the density of the core, the more firm the mattress will feel. Corner Guards: (Also known as Corner Protectors) The pieces of plastic the cover the bottom corners of your box spring (box, foundation, base, etc.) and prevent the fabric from snagging on metal bed frames. Durability: How long a mattress will last and actually stay comfortable. How well a mattress holds up under normal usage and wear. Duvet: This is a French word meaning “cover.” This term is fairly interchangeable with “comforter.” These are the large blankets seen on top of made beds. They consist of a large pocket(s) filled with a batting material (e.g. wool, down, cotton). Edge Guard: This refers to any measures the manufacture takes to improve the durability/stability of the sides of the mattress (which can take a beating from repeatedly sitting on the edge of the bed). This bolstered support is most commonly seen in the form of extra strength foam, or stronger border wires. False Loft: Chances are you have encountered this problem. This is the practice of loading up a mattress with a low-quality materials in a attempt to make the mattress appear thicker. So while the showroom mattress might look like a two-foot thick cloud, chances are, after a year, that cloud will look like one of Tom Brady’s footballs. Firming Pad: A thin, firm piece of bedding designed to be placed either underneath, or on top of, a mattress in order to increase the firmness. Foam Fatigue: All foams compress under weight/pressure, and then expand back to their original shape. After time, this continued compression and decompression wears on the foam, causing the reaction to lessen over time. This is foam fatigue. Fatigue sets in earlier for foams of a lesser quality (polyurethane/memory foam), while higher quality foams (botanical latex) tend to last the longest. Foundation [see also Base or Support System]: This is a new age term for what is commonly referred to as a “boxspring.” In recent years manufacturers have moved away from the use of springs and coil systems in their bed bases, but the term boxspring has stuck around! Gauge: The thickness, size, or capacity of something in particular (usually a standard measurement). In mattresses this will almost certainly be referring to the thickness/quality of the steel used in the border wires and coil system. Gel Foam [see also Poly Foam]: A foam made by adding water to polyurethane plastics. GOTS Certified [see also Organic]: The Global Organic Textile Standard is the worldwide leading textile standard for organic fibers. They certify organic products based on the processing, manufacturing, packaging, labelling, trading and distribution of all textiles made from at least 70% certified organic natural fibers. Hybrid Mattress: A mattress that combines different types of support systems and materials. Many innerspring mattresses are getting comfort makeovers by the addition of different foams. Indentation Load Deflection (ILD): This is a measurement that defines the firmness of the foams used in mattresses (or other items). It is defined as the amount of weight necessary to compress the foam by 25 percent. Foams with a higher ILD will be more firm than foams with a lower ILD. Innerspring: A type of mattress whose core consists of numerous coil springs, enclosed by a padded cover. Dunlop: The oldest, and most common, latex manufacturing process in the industry. The rubber sap is whipped into a frothy mixture, then placed into a mold, and baked to solidify the mixture. The natural sediment and particles settle at the bottom on the mold, often giving dunlop latex a firmer feel on the bottom, and softer on the top. Talalay: A more advanced process, talalay latex starts with the same frothy rubber sap mixture as Dunlop, but the mold is vacuum sealed to extract any additional air. Then, before baking, the mold is frozen to help stabilize the material. This latex foam usually has a thinner profile, and more consistent feel. Leather Match: A type of fabric, usually vinyl, that is designed to have the look and feel of real leather without the high price, and rigorous care sometimes associated with the real product. Leather Match is often used in the less visible parts of furniture (i.e. the back and sides). Loft: The height gained by additional comfort layers/materials being added on top of the core of the mattress. Mattress Cover: Similar to a protector, but with the design of a fitted sheet. These are used to protect the topside of the mattress against spills, stains, and other types of wear. Mattress Pad: Bedding designed to improve the comfort of the mattress. Some add an extra layer of padding, while others help to regulate sleep temperature. They are placed between the mattress and the top sheet. Mattress Protector: A type of bedding designed to protect the mattress against everyday use, spills or stains, bed bugs, and dust mites. These items usually encase the whole mattress and are sealed off with a zipper to prevent anything from penetrating the cover. Mattress Sizes: There are six standard sizes (listed below) used throughout the furniture/mattress industry. If you need a mattress in different dimensions, don’t fret! We make those too! Mattress Topper: Bedding item designed to alter the firmness of a mattress. These are usually bulkier than mattress pads, and offer a greater change to the feel of the mattress. Memory Foam: (Also known as Viscoelastic Polyurethane Foam) A foam made by adding water to polyurethane plastics. The chemical composition and ratios are altered to give this foam the sinking support its known for. Microdenier: A denier is a unit of measure for the linear mass density of fibers, listed as the mass (in grams) per 9000 meters of the fiber. Microdenier is the term used to describe a fiber with a density below one gram per 9000 meters of the fiber. Microfiber: A very fine, synthetic yarn. Murphy Bed: A bed that is designed to be stored vertically. It is hinged at the bottom to allow the bed to be pulled down when needed, and stored vertically to save space when the bed is not in use. Natural Latex [see also Blended Latex or Synthetic Latex]: Latex that is tapped directly from Rubber Trees, cleaned, and cooked without using additives to alter the properties of the latex foam. Organic [see also GOTS Certified]: Of, relating to, or derived from living organisms. Pilling: This occurs when a textile or fabric starts to develop little balls of fiber or fluff on its surface. Platform Bed: A type of bed frame that provides a solid support system, allowing the mattress to be used without needing a boxspring(box, base, foundation, etc). Pocketed Coils: (Also known as Marshall Coils) This support system consists of steel coils individually wrapped in fabric. Because the coils aren’t interconnected with each other, the sleeper is less likely to experience motion transfer from their pet/partner. Poly Foam [see also Gel Foam or Memory Foam]: A foam made by adding water to polyurethane plastics. Quilt Top: A quilt is typically a three-layered textile, composed with a top fabric, a layer of batting, and then a woven back. A quilt top mattress’s outermost layer is covered in, you guessed it, a quilted material. Split Mattress: A mattress with different firmness levels on the left and right halves of the mattress. These are typically used by couples that can’t agree on the level of firmness for their mattress. Springs [see also Coils]: The steel springs used in mattresses. Storage Bed: A bed frame with built-in storage space beneath the surface the mattress lays on. These are typically drawers that are accessible from the sides of the bed, but designs vary. Support System: Refers to the slats and center-support rail in bed frames. The quality varies by bed frame style and manufacturer. Surface Feel: The level of firmness associated with a specific mattress. Common terms include: Extra Plush, Plush, Cushion Firm, Firm, and Extra Firm. Synthetic Latex [see also Blended Latex or Natural Latex]: This is a foam that is produced in order to mimic the look and feel of natural latex. These foams are made using petrochemicals, rather than natural materials, making them less durable and susceptible to off-gassing. Thread Count: The number of horizontal and vertical threads per square inch of fabric. This measurement is often used to determine the quality of the bed sheets; however, this measurement only gives a glimpse into the overall quality of bed sheets. Ticking: A tightly woven textile fabric of cotton or linen used in upholstering and for the covers of mattresses and pillows. Wicking Fabric: Fabrics that have been designed to pull moisture away from the body. They are commonly used in workout clothes, but also serve a purpose in the bedroom, helping to regulate your body temperature while you sleep.